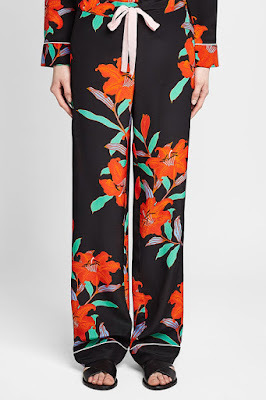 Add some fun, vibrancy and colour to your summer time look with a pair of patterned trousers, so easy to accessorize and let the trousers make a statement – these will add a huge pop of colour for your day time look with a simple top or look great in the evening or on your holidays ……. This season, Oscar de la Renta explores a jungle theme with energetic prints inspired by tropical foliage adapted from 19th century botanical illustrations. 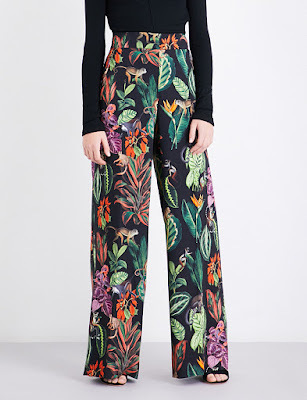 Designed with a structured high-rise waist, these wide-leg trousers fall fluidly in stretch silk, as playful monkeys and lush greenery modernise the classic cut. Style yours with a finely knitted turtleneck jumper tucked in and sign off with a pair of strappy heels. From the high-rise fit to the tapered legs, these printed pants from Etro are a luxurious but contemporary statement in pure silk. 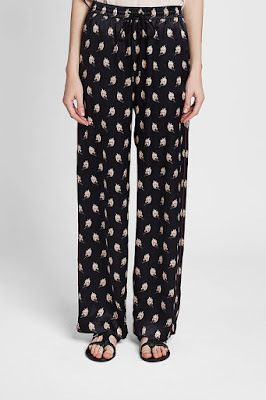 Note the elasticated waist as a youthful touch that keeps them comfortable. Architectural and artistic, Roksanda Ilincic’s SS18 collection relaxed her signature structured silhouettes into more fluid forms. The Bohri trousers may well be deftly tailored into sharply cut wide legs, but the pure silk profile renders the fit liquid-like. 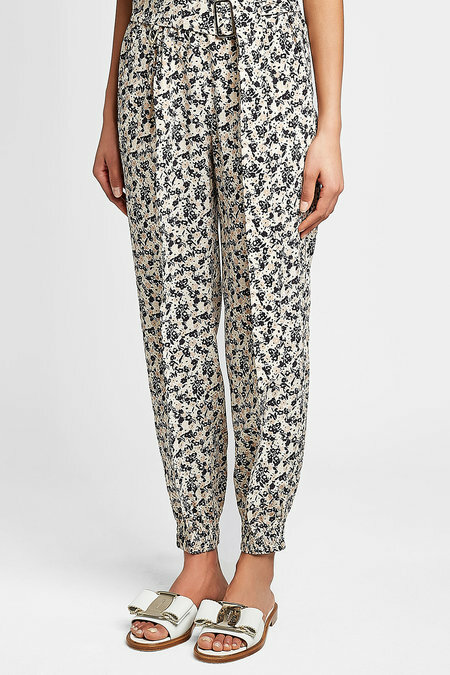 Floral prints double the effect, wafting this high-rise pair over your frame with the languid ease we all crave from sleek summer styling. 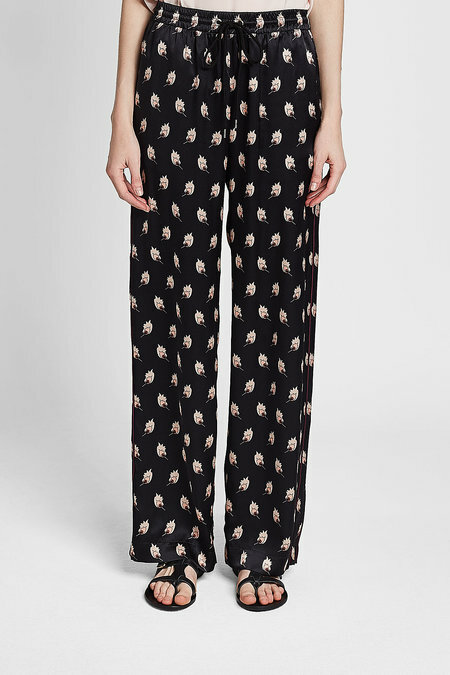 Markus Lupfer and playful polish go hand-in-hand, and we're smitten with this pair of black silk pants, complete with an ornate floral motif and bright red piping down each leg. 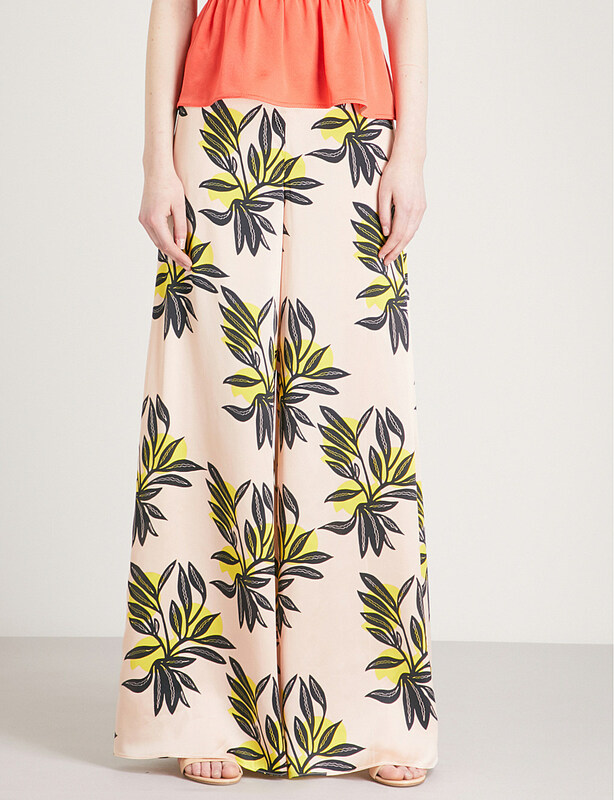 The wide cut and elasticated waist adds an undone ease that's effortless to style. A fun floral print and a tapered fit informs the unexpectedly luxe silk composition of these Max Mara pants, making them an indulgent choice to channel playful polish. A belt on the high waist keeps them effortlessly flattering. 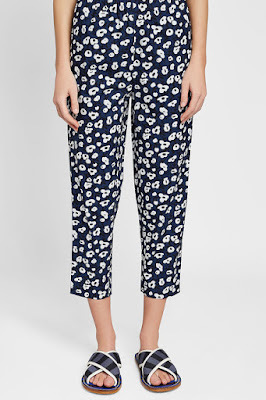 Dark blue fabric and a white floral print make these tapered cotton pants a fun and youthful choice from Marni. The slim leg is easy to style in a hurry while the elasticated waist promises all-day comfort, whether styled for casual or eclectic polish. 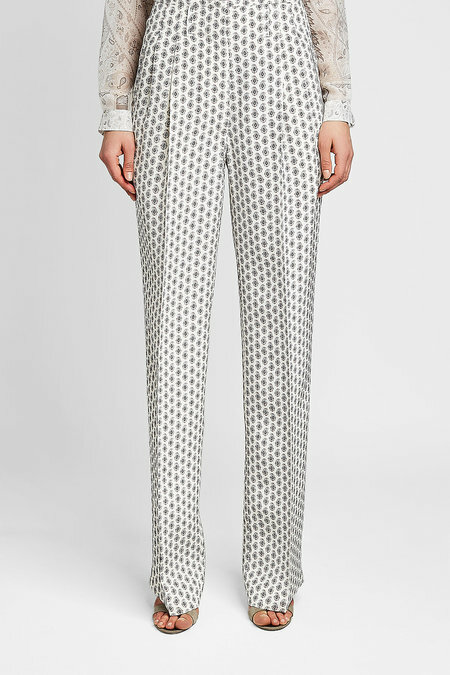 Cut with volume through the legs and a high-rise waist, these black pants from Diane von Furstenberg are printed with a bright orange and green pattern for the most feminine and refined finish. 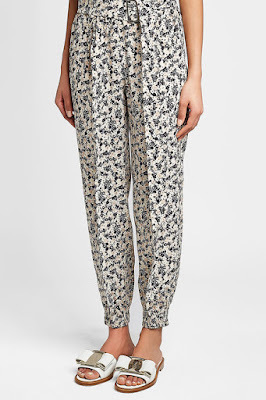 Lightweight and indulgent, the silk composition keeps them comfortable and chic. 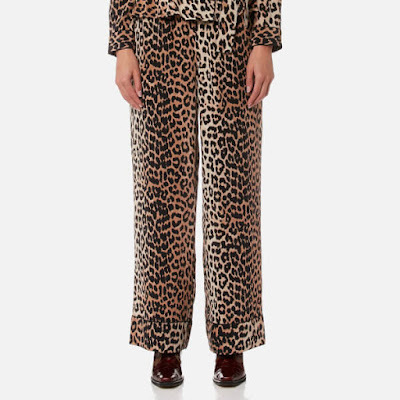 Fabulous leopard print wide leg trousers from Scandinavian brand Ganni. 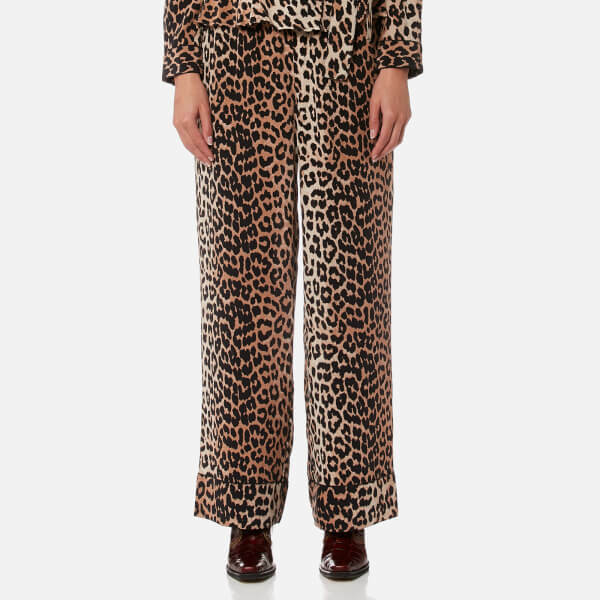 Cut from pure silk with an all-over animal print, the 'Fayette' pants feature an elasticated waistband with button fastening and decorative fly. 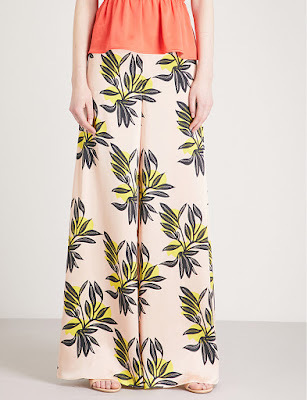 Complete with two side seam pockets. 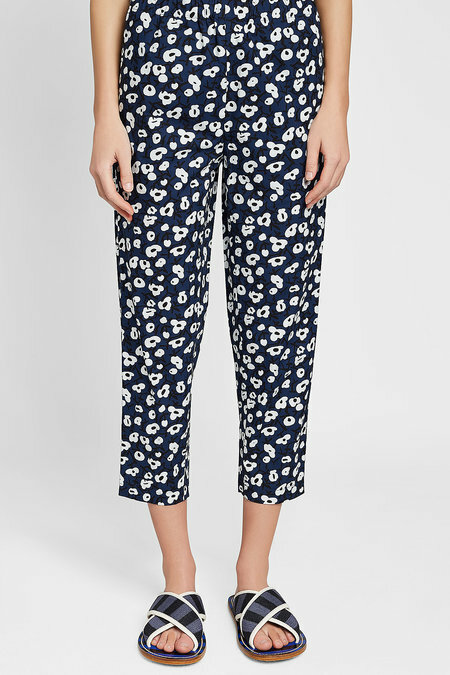 This limited edition pair comes in our ever-popular 7/8th length these Boden-exclusive Wild Bloom design blossoms across the rich navy jacquard. The ultra-flattering, ankle-grazing finish and subtle splits at the hem are ideal for showcasing our Icons Tie Back Heel. They have a slim fit, discreet pockets and a contrasting trim down the sides to really make a statement.